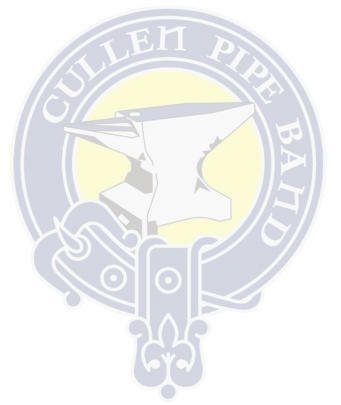 Cullen Pipe Band (known as Cullen Piper's Band in the old days) was founded in 1941. It could well be said that it first saw the light of day at the home of Paddy Fitzgerald, Mologhroe. At that time Micheal Rea was the local postman for the district, he was both an Uileann and Bagpiper, and it was noticed he had a practice chanter in his bag which was seen by someone present. Micheal, who was also an uileann piper shared his talents with a local group of young men, and at the end of a few seasons had them playing a few tunes on the practice chanter. Then came the purchase of the pipes-incidentally costing 6.13s.6d. At this stage of development the drummers were being coached by a Mr. Baker who worked with C.I.E. The many nights spent learning and the availability of Dineen's Hall in those early days was of vital assistance to get the band established. Most of the equipment was obtained at Crowley's of Cork, and some drums came from the old Fife and Drum Band, the Bass drum being obtained in controversial circumstances. The first Pipe Major of Cullen Pipe Band was Mr. Stephen Casey.Uniforms were not acquired for a few years, most of those were got in Cork City, a few in Newmarket, and the remainder made by Paddy Fitzgerald. The uniforms made their first appearance on Laitiaran Day in about 1943, and were blessed after mass by Fr. Griffin. These first uniforms consisted of an army type tunic and a green tartan kilt. Knocknagree Races, a significant day of local revelry in the 1940's as was Feis Laitiaran in Cullen, provided two local platforms for performance. The Cullen Piper's Band replaced the Cork City Pipe Band which had been an annual attraction in Knocknagree. Carnivals, parades, celebrations, political occasions, etc.,were all demanding the services of the band. Sometimes indeed, the demand was very time consuming, as for example in 1951, when Eamonn De Valera was running an election capaign in Kerry, the band led the parade first into Killarney, then to Killorglin and finally at nightfall on the same day into Cahirciveen. Travelling from one venue to another was done in the early days in the back of a lorry, generously provided by Micheal D. Murphy. Later on in the Fifties a bus was used. Indeed, many locals travelled on the bus also, and whilst it provided an excellent day's outing for these people, it also helped to defray expenses for the band. Many stories are told of different incidents and experiences about the band - such as a brave attempt, urged by political conviction, to relieve the flagbearer of the tricolour as happened in Cahirciveen, or the less serious events such as happened in Killarney, when a certain drummer, pressed for time, folded the trouser-legs above the hem level of the kilt, and after some ten minutes of marching, the concealed articles insisted on revealing themselves, very much to the embarrassment of the wearer but naturally to the amusement of the onlookers. For many reasons, the band went through a somewhat inactive period between the mid sixties and the early seventies;in fact the band did not play at all for about eight years. However, this spell of inactivity was not allowed to continue for too long. Teddy Goulding and the late Johnny Fleming decided to reconstruct the band again. A number of former members were contacted; a meeting was called,and on St. Stephen’s Day 1971 the first moves to re-establishing the Cullen Pipe Band were initiated. Then on St. Laitiaran’s Day 1972, which incidentally, coincided with a Mid-Cork by-election and the presence of the former Taoseach Jack Lynch in Cullen. The newly reformed,though dishevelled, Cullen Pipe Band struck up it’s first tune after a lapse of eight or nine years. Other changes included a completely new set of uniforms, a new set of drums, several new sets of pipes and the tricolour had been replaced by a staff. The first piping contest entered was in Limerick in 1982 where the band came in first place. Many new young members joined the ranks as pipers and drummers during the 1980's, and the plain green kilt adopted. Classes were established and outside tutors were brought in to provide the lessons. In 1991 the band celebrated its 50th anniversary and honoured the founder members. 1995 the band won champion of champions grade 4. In 1998 the band won the All Ireland pipe band championships grade 4. In 2001 in band celebrated its 60th anniversary. A new set of Uniforms were purchased and the band also took part in the St.Patrick´s Parade in New York. The next major honor for the band was winning the World pipe band contest in Grade 3B in 2007. Grade 2 is the 2nd heighest grade in the pipe band competing world. Cullen won the All Ireland pipe band championships in grade 2 in 2012 which was held in Ballina co Mayo. Also that year the band won 4th place at the Scottish championships in Annan Scotland. During the band´s time in Grades 3 and 2, many players from the Munster region and beyond came in to play with the band and made a huge contribution to the standard of the band. In 2014 some decided to call it a day and since then the band has been concentrating in its local young members.competing in grade 5 since 2014, the band has been steadily been improving,and won the East of Ireland championships in Howth in 2016. The Band celebrated its 75th anniversary in 2016 and also played at many commerations to mark the 100th anniversary of 1916.